Bill has been writing and playing music in bands and on his own for just about as long as he can remember. He began joining rock bands in the mid 1970s as a teen in Pennsylvania. 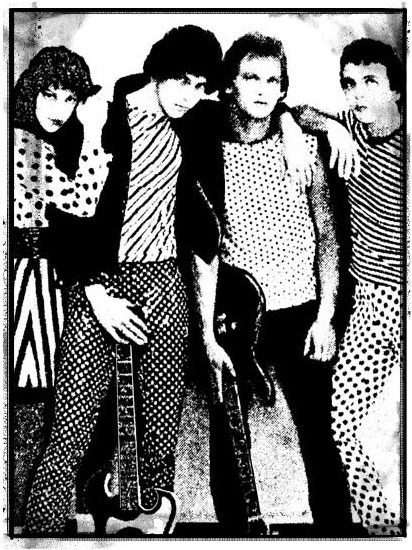 With the garage punk quartet Tina Peel he played under the stage name Rowdy Doody on various EPs and other live compilation recordings – including Pajama Party, More Than Good Looks, and 60 Seconds Over DC – before moving to Texas and then California, where he played the club scene as a solo artist and later in a band Bill formed with collaborator and guitar whiz Wayne Ditzel (formerly of the iconic San Francisco band the Readymades). That’s a very young Bill Magill, aka Rowdy Doody, second from right in the photo by the way. Bill’s first full-length LP – Eskimo in the Sun – was released in 1996 with the help of Wayne on lead guitar, David Fox on bass, and Dave Dewey on drums. Marvin McFadden, of Huey Lewis and News, played trumpet on Dance Hall Girls, and Dave Wellhausen engineered and co-produced the recordings at the renowned Dave Wellhausen Studios in San Francisco. In 2012 Bill started fleshing out songs for a new LP. That album, Last Night at the Ha-Ra, was recorded in 2018 with The Vivid Stage, a group Bill founded with Russell Cottier (production), David Dower (keyboards and musical direction), and Jon Fellowes (guitars). Last Night was recorded at La Buissonne studios in Provence, France, with additional sessions at Parr Street Studios (Liverpool), and Megasonic Sound (San Francisco area). Numerous guests contributed, including Pete Thomas (drummer for Elvis Costello and the Attractions), Daniel Mille (award winning French accordionist), Rie Sinclair (LA-based recording artist and chanteuse sublime), Mariachi Neuva Generacion of San Francisco, and others. Last Night at the Ha-Ra is now available on Spotify, iTunes, and most all of your favorite digital music outlets.